She dreamed herself back in the garden again, crying over the dead beast. It was all as she remembered it: the buzzing flies, the stink, the matted fur, the dying roses. Only this time, her tears washed the blood from his oh so soft fur, her kiss raised him from the dead, and her hands felt one beat, then another. And then she was in his arms, his paws running up and down her back, his claws digging into her, and she had raised her soft lips to meet his, part of her mind screaming animal animal the other half remembering their endless conversations over dinner, or in the garden, the way he had brought her half torn books in his large paws, the way he had flooded her room with roses every morning, the way she had dreamed of him, night after night, even safe at home with her sisters, dreamed of his laughter and jokes and his terrible, beastly face. And then she was kissing him, kissing him, feeling him change, feeling him shorten, feeling the fur beneath her hands shift into skin, smooth and damp and oh so human, and now she was really kissing him and he was really kissing her, both of them pausing to murmur words of love and desperation and devotion and then her shift — for she was no longer wearing the elaborate silk dress she’d been wearing when she found the beast, a dress she’d put on to awe her older sisters, to say see, see, I did do better than you, I did, I did, but a simple grey shift that hung straight from her shoulders to the floor — her shift was ripped and torn and lying in the ground and she was tumbling with the beast no not beast not beast not beast the man, the prince, over the garden, and the roses were blooming, blooming, then falling, failing, their thorns piercing her skin until she cried out and awoke, back in her ordinary room with its grey walls and shuttered windows, gasping, remembering the feel of the cold unmoving body beneath her hands in that garden. And she raised her hands to her face, looking at the blood there, at the thorn jabbed in her palm, and she wept in her grey shift as the familiar walls of home closed about her. Mari Ness spends far too much time attempting to reason with cats, and convince them that even in fairy tales, no cats, talking or otherwise, were allowed to use laptops as cat beds. Her work has appeared in numerous print and online places, including Fantasy Magazine and Polu Texni. She lives in Central Florida. 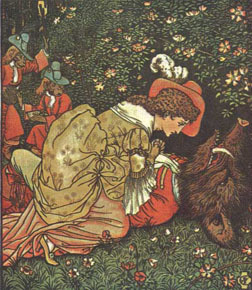 Image: Beauty & the Beast, Walter Crane, Illustration for Beauty and the Beast. 1874.